The Melanie Kisten Dance Academy’s smash hit Kambakht Ishq is back with its signature scintillating, mesmerizing, scorching and vibrant dances. It will run at the iZulu Theatre at Sibaya on October 22 and 23. Conceived, produced and choreographed by the Melanie Kisten, Kambakht Ishq 3 (loosely translated as “Damn Love”) tells the story of love, infidelity and reconciliation as lived by a host of distinctly Chatsworth characters complimented by dynamic and vibrant choreography is bound to keep the audience spellbound. Kambakht Ishq 3 is a dance and drama production and marks the 20th year of The Melanie Kisten Dance Academy. The Melanie Kisten Dance Academy trains students in a number of dance forms, and produces and participates in major performing arts projects. Principal Melanie Kisten has created a comedy dance showcase with a strong narrative as a platform to showcase the talent of her dancers and the skills of her associates in a cast that includes a host of talented newcomers. 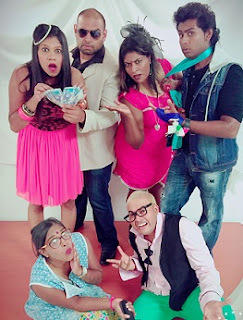 Kambakht Ishq 3 has performances October 22 and 23 at the iZulu Theatre, Sibaya. Tickets R100 booked at Computicket or contact 083 235 1207 for further information.